My question is about how to set up a chlorinator on my home well that operates based on water flow. My neighbor has a chlorinator pump that turns on and injects chlorine every time the well pump turns on. That won’t work me, because I do a lot of irrigating during the summer and I don’t need or want all that water to be chlorinated. We have a small amount of sulfur odor and also iron bacteria. We get rusty stains and some slime in the toilet tank. I have a water softener that works fine, but it needs extra maintenance because of the irony slime. We have 1-1/2 baths and it’s just my wife and me in the home. I want to inject a small amount of chlorine bleach, right before it enters our home, can you tell me how to do that? Yes that is a simple system to set up and very effective. Note that a Contact Tank is required for mixing time after the chlorine is injected, before the filters and this is explained further below. 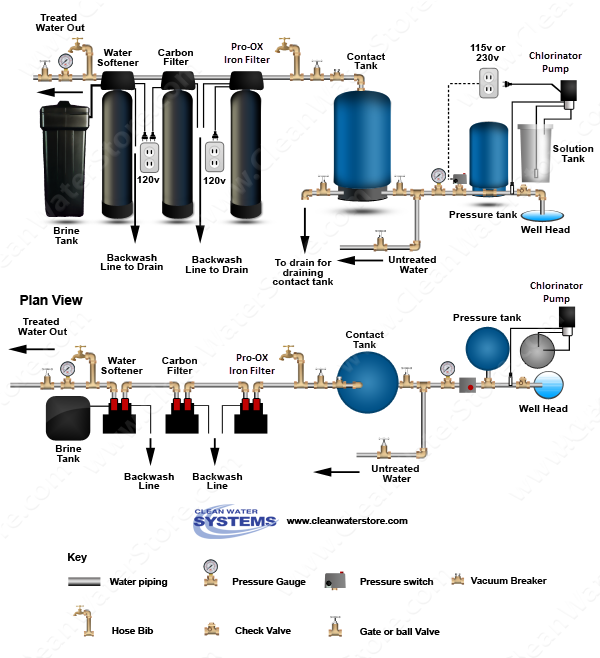 How this application will work is the chlorine bleach solution is injected whenever the water flows through the Flow Meter which well then energize the Metering Pump to begin injecting solution based upon the rate of flow. Once injected the 30 gallon contact retention tank allows for enough contact time for the chlorine to react with the contaminants and fully oxidize for filtration. 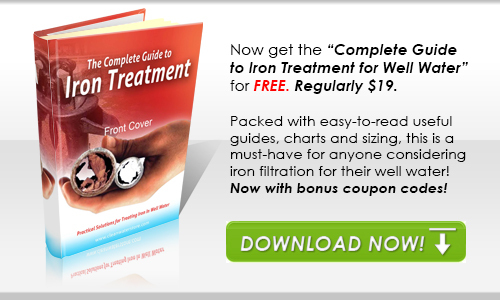 The Iron filter then removes the oxidized contaminants. The Pro-OX iron filter media will work really great with the bleach, and not only enhances performance, but also extends the life of the filter media for many years..
After the Pro-OX iron filter, a backwashing Carbon system will remove any chlorine residuals for use in the home in addition to improving the overall taste & odors. Carbon does an excellent job in polishing water for the end user as well and prevents any chlorine residual in the house. The final stage would be your existing water softener. The Precision-24 self-priming chlorine pump systems are easy to install by anyone familiar with basic plumbing and very easy to maintain yourself. Settings for the pump will be provided as well as the ratio of bleach and water to be used. 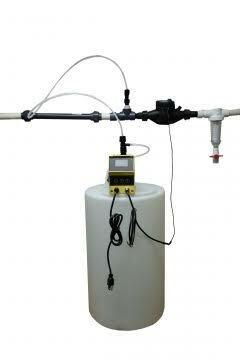 See this video on how simple it is to wire the flow meter to the chlorine pump. How To Wire a Flow Meter to Your Proportional Feed Chlorinator The chlorine pump is plugged into a 110v wall outlet, and then whenever there is flow of water, the right amount of bleach is injected based on how fast or slow the water is flowing. The end result is you get just the right amount, not too much or too little. Pro-OX Manganese Dioxide media is an NSF Certified natural high purity medium which utilizes an oxidation-reduction reaction and filtration process similar to Greensand, but at a much higher level of performance. Pro-OX has a much higher surface area, is much more porous. It also lasts much longer (usually between 8 -10 years) compared to around 5 years maximum for other filter medias. The backwashing systems are fully automatic and use the reliable 5900e control valve for dependable filtration with minimal maintenance requirements along with being quite user friendly in operation. Easy Installation! No-Wiring Needed! Plug into any 110V wall outlet, and when there is flow, the Precision Metering Pump will instantly and accurately inject the precise amount of chlorine (or other chemicals) based on the flow rate of the water! Output rating: 0.1 – 22 Gallons per Day (GPD). Pressure rating: Will inject into lines with up to 110 PSI. System comes with a 1 year warranty on the Pump and Meter. PRECISION 24 Home Well Water Pump with 15 gallon heavy-duty polyethylene solution tank, CWS Lead-Free 3/4" NPT heavy-duty nylon engineered plastic flow meter and cable, Tubing and fittings to connect pump to injection check valve, 1 Injection Check valve 1/2" NPT, and easy to read manual. The CT-30 tank is a durable easy-to-install retention tank designed to provide optimum contact time during chemical treatment. These lightweight seamless totally non-corrosive retention tanks are ideal for new and replacement installation where durability is at a premium. 100% non-metallic polymer materials. Impervious to chemical attack. Comes with 1 inch inlet. Dimensions: 13”Diameter x 58” Tall. 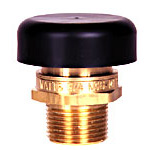 Vacuum breaker relief valve Watts 1/2" male 200 PSI maximum. Required for contact and retention tanks to prevent vacuum in system and avoid imploding vessel. 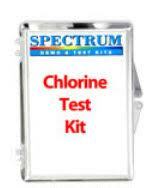 Quickly and easily test for available chlorine using drops, 50 tests included. Much more reliable that test strips and help in maintaining a proper residual in your system. Pro-OX Iron Filter 5900e Series includes 1” pipe connectors; by-pass valve; Pro-OX Manganese Dioxide NSF Certified filter media; 8” x 44” filter tank & automatic backwash control valve with digital display. Controls and adjustments are a big plus with this control valve. Not to mention the media will be good for 10+ years depending on water quality and usage. Dimensions: 8” Diameter x 44” tank, with valve attached is approximately 51” tall. All installation instructions and tech support is provided for you as well. Excellent Warranty: Industry leading 7 years on the control valve & 10 years on the mineral tank. All the filter media you need for the system is included. Excellent for use in removing residual peroxide from water once injected, along with improving overall tastes and odors. Long lasting & durable this Coconut Shell Carbon typically lasts for 4 - 6 years and is easily replaced. Much longer life and higher flow rates than standard carbon. Unlike carbon cartridges which can trap sediment and dirt causing pressure drop these systems automatically backwash out trapped sediment alleviating pressure drop. Dimensions: 8” Diameter x 51” Tall with control valve. 1” pipe connectors and bypass is included. We also provide full installation and start-up guides directly to you and are available for Tech-support. Excellent Warranty: Industry leading 7 Years on Control Valve & 10 years on the media tank.